Upright and electric bassist and composer Nick Abbey has become an integral fixture of the jazz and contemporary music scenes in WA since arriving from Melbourne in 2006. As a performer, Nick has appeared with the likes of international luminaries George Garzone, John Scofield, Paul Bollenback, Alex Norris, Jim Pugh, Howard Levy, and Troy Roberts, as well as local legends Paul Grabowsky, Jamie Oehlers, James Morrison, and Graham Lyall. Aside from his main ensemble TRISK, Nick is also currently an active member of Abbey|Foster|Falle, Det Nopsus, Libby Hammer Quintet, Hammer 9, Johannes Luebbers Dectet, Paul Grabowsky’s Perth Sextet, and The Fix, amongst others. 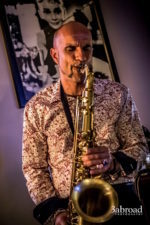 Nick’s compositions have repeatedly drawn accolades, including the recently announced award of the WA Music Industry’s Jazz Song of the Year 2014 for a new TRISK tune entitled Charon. This is Nick’s third consecutive receipt of this accolade, with tracks from Abbey|Foster|Falle’s Brotherhood album previously taking it out in 2012 (Maelstrom) and 2013 (Avina). Nick has toured nationally and internationally (including Singapore, China, France, and Italy), has featured on over a dozen recording projects, and has recently commenced Ph.D studies at the WA Academy of Performing Arts, focusing on rhythm and extended techniques of the upright bass. Keep up to date with Nick at www.triskmusic.com!